This weekend started with a flavor of that old Western entitled "The Good, The Bad, and the Ugly": I have been sick, work is piling up as a result, and one listens to all sorts of bad news everywhere. I think that I will try to be positive here. So, instead of going to the dark side of life, I am going to move into the silver lining of the dark cloud. 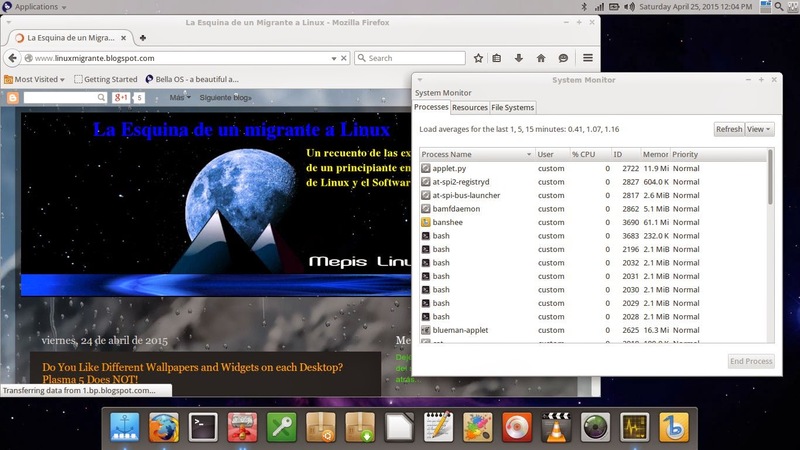 Megatotoro reports that one of the aesthetic features that attracted me to Linux, the chance to have different wallpapers on the virtual desktops, is not working in Plasma 5 because of a bug. I know that some will dismiss the issue as an exaggeration or a waste of computing resources to favor eye-candy. Well, they can think that way. However, for people like me, the change of desktop wallpaper provides a relief from mental strain when working for a long time on a writing project. I hope they fix the bug... I really do. I mean, KDE has been my desktop of choice since I migrated to Linux. While I am sure I can adapt to other DEs, I am fond of KDE. I will miss the feature, for sure. After a rather long wait that was making me nervous and silence in both the Mageia and OpenMandriva camps*, OpenMandriva announced the new alpha release, code named "Einsteinium." * UPDATE-- It seems that the news on Mageia 5 RC missed DistroWatch, whose last report on the Mageia front was the release of Beta 3 on Feb 14, 2015. I just learned that Mageia 5 RC is available for download! I downloaded the ISO and tried to run it in my ZaReason Strata laptop, but it would not boot. Curiously enough, it worked perfectly in a VM. No Firefox this time, friends. All hail Qupzilla! 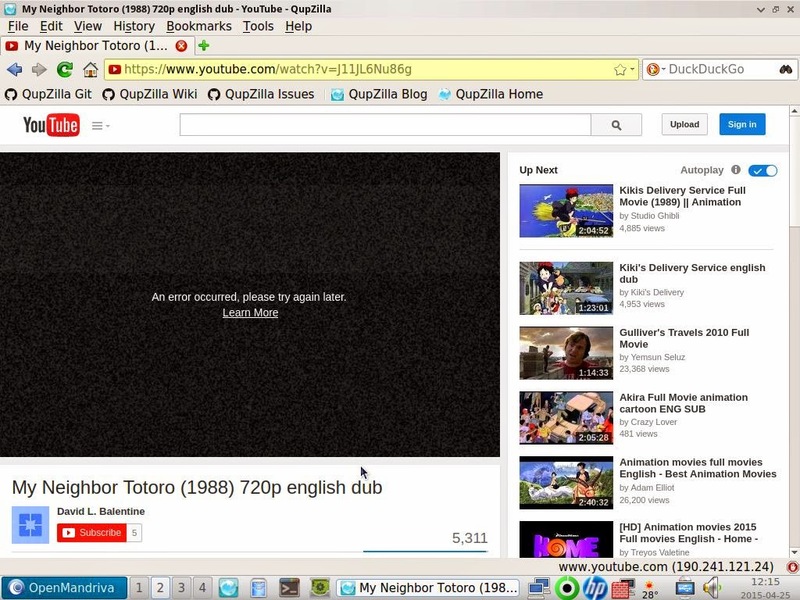 I couldn't play YouTube videos... I guess it's a flash problem. Fine, this is an alpha release, after all. I didn't see LibreOffice, but Calligra. Since I did not install the alpha, I could not try Calamares, the new installer. In their release announcement, the team says that they are "mixing the ingredients together." 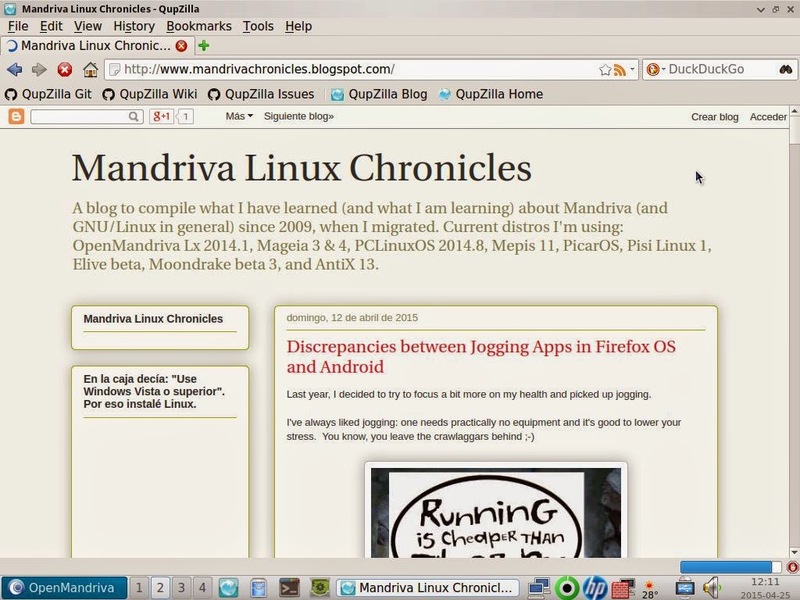 I myself have mixed feelings about OpenMandriva right now, but I consider it is good to have a release. 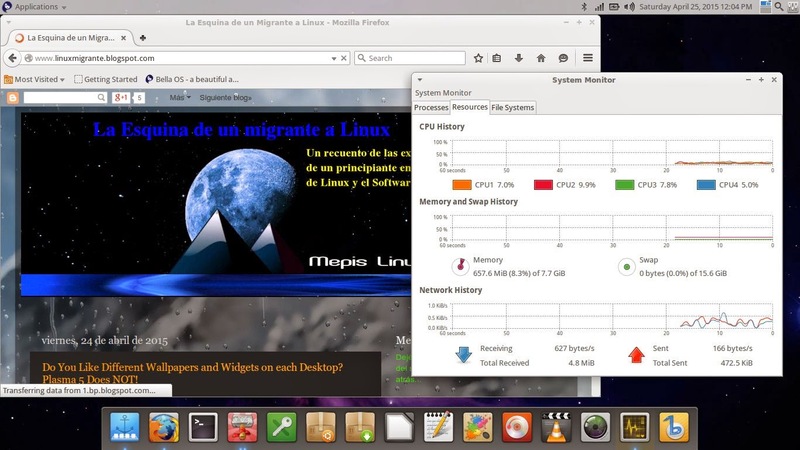 Some weeks ago, DistroWatch announced a newcomer into the Linux landscape: BellaOS, another Ubuntu derivative... or should I say a Linux Mint/Xubuntu derivative, as the creators state it on their website? 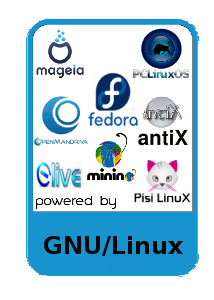 I tried out the distro out of curiosity. It was a pleasant surprise because the distro lives up to its name (Bella means "beautiful" both in Italian and Spanish). For a lightweight, the main desktop looks pretty and does not require a lot of training to be used. 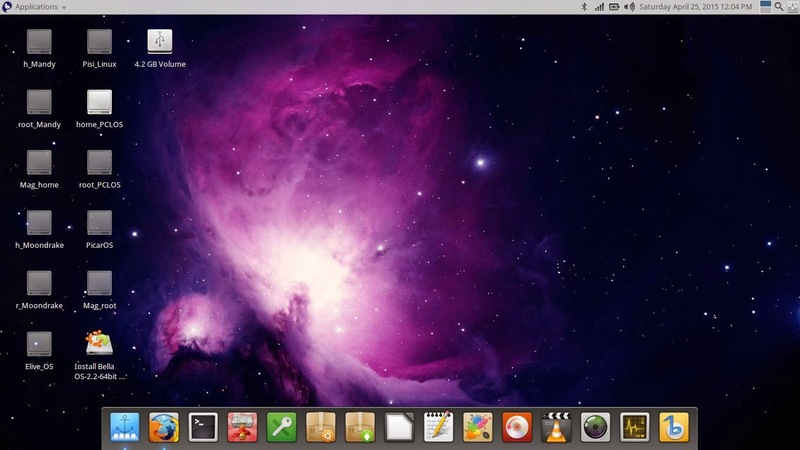 It is a customized version of XFCE with a deck at the bottom. BellaOS lets you have different wallpapers on the workspaces! The system sees my other Linux partitions, too. Lxqt...being that one the heir of my always-liked LXDE, I wonder if it could run Compiz well. That'd be great! You know, when MX started, it included Qupzilla. But devs later decided to have heavier browsers because it had a series of issues (flash among them).